First off happy 19th birthday to my dearest sweetest Allison. Glad to have her back for the next couple of weeks before she heads off to Denver where she’ll be doing a dual externship. Pastry and baking for the Denver Broncos and Red Rocks Amphitheatre. I’m proud of you! 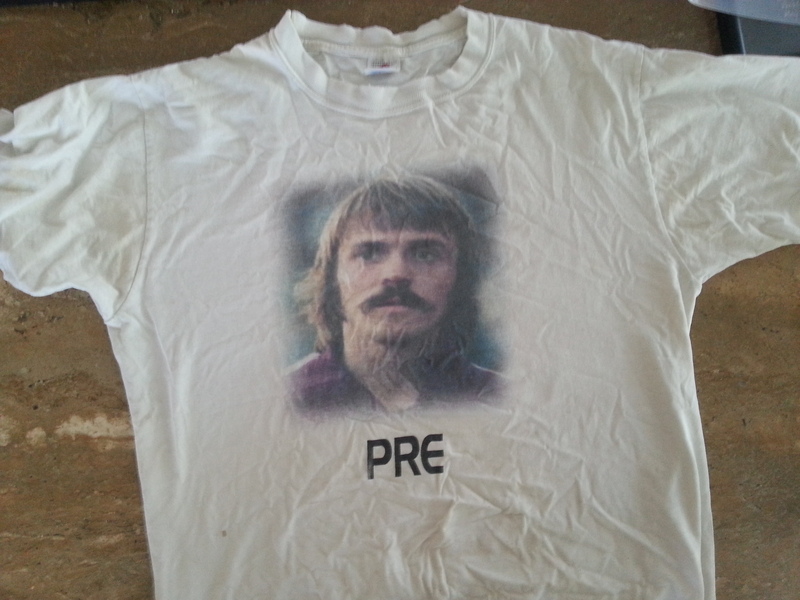 And today I’d like to share just a few of my favorite Prefontaine items. 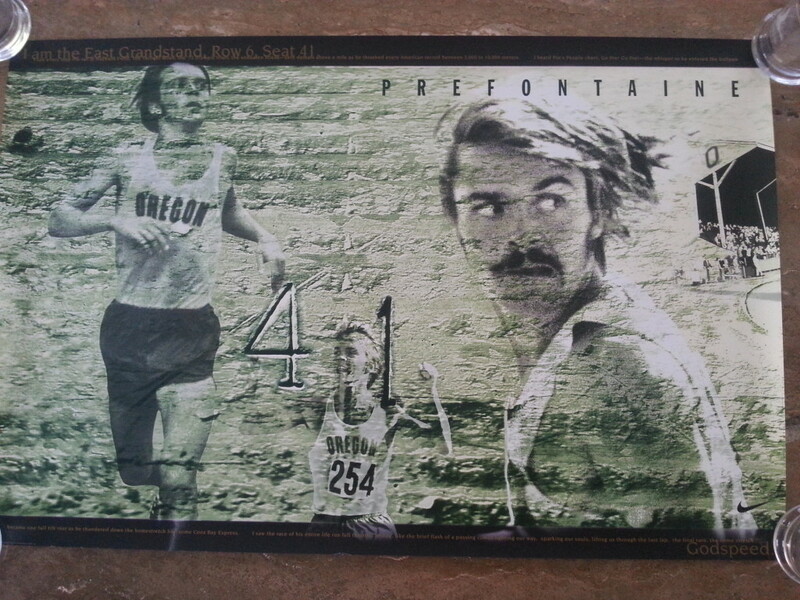 Unframed Prefontaine posters are hard to come by. This one features his iconic quote. This photo of Pre and Frank Shorter on May 29, 1975. Taken by Geoff Parks, right before Pre’s last race. 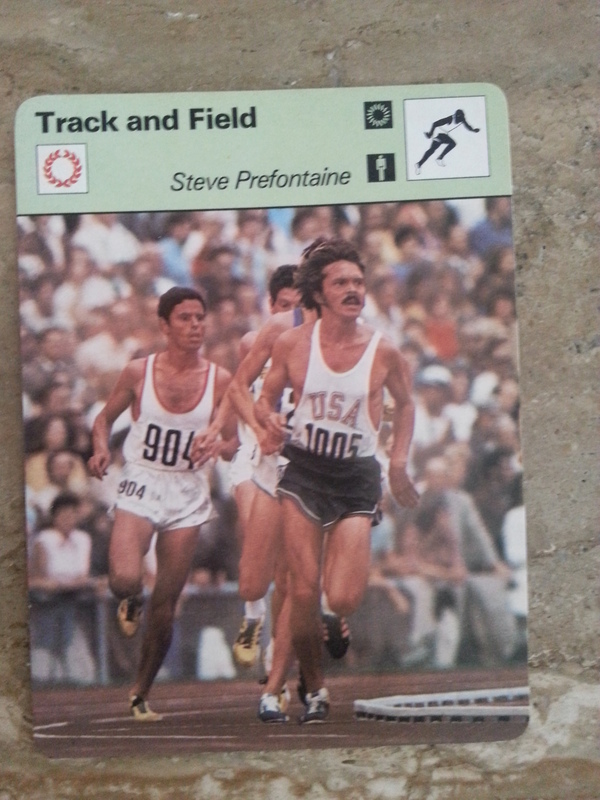 The very rare and highly collectible Prefontaine Sportscaster card. Here he leads the 1972 Olympic Games 5000 meters. 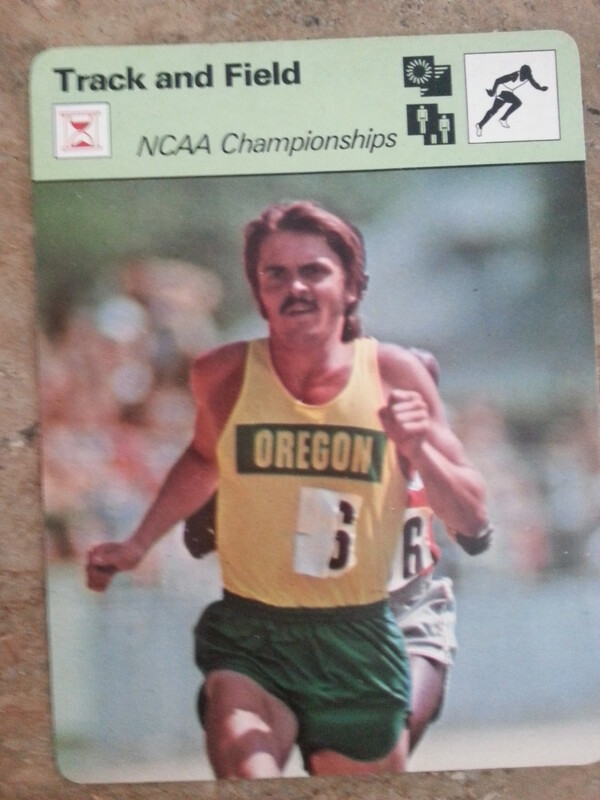 And the even more highly prized Prefontaine NCAA Championships Sportscaster. And my favorite shirt. 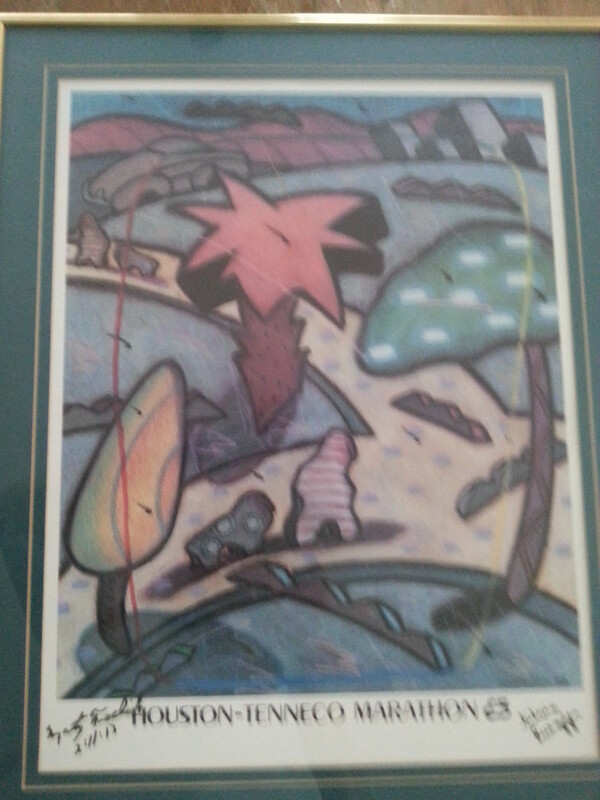 Gifted to me by John L. Parker Jr., author of Once A Runner. This entry was posted in Uncategorized on August 30, 2013 by runguru. The runs of the last few days are inciting reverie. Out a little later for yesterday’s 6 miles, 86 degrees when finishing up. Loving every step. Reminded of my quarter of a century on the Gulf Coast. The Good and Cleansing Purge. My Three Favorite Things all make me sweat profusely. While living in Texas there was no escaping the heat and humidity. You trained in it 9 months, or 10, every year. Typically January and February were the only breaks. Its easy for me now to just jump out and get it on. Good luck to everyone Racing the Bill Seymour Half Marathon this Saturday, going to be Hot as the Dickens. Will likely end up a race of attrition with the person best suited to heat running taking the win. Still with the recurring mantra though: Hydrate to frequent potty breaks! And another good bit of advice, keep a full glass next to your bedside and drink up at night as well. Avoid gatorade, powerade, and any other “ades.” Stick to cold water whenever possible. Supplement sparingly with the Upstream Brewing Company’s Seasonal Lager. A fine Pilsner right now. I’ve given Stacy Shaw credit as the top female masters long distance runner in Nebraska. Followed Very Closely by Natalie Jetensky. Of course my dear sweet Linda is heads above them and all others in the middle distance arena. But the name no one should forget is the lady that owns the best marathon pr of any woman from Nebraska, (2:39:25), Roxi Erickson. Granted it was set in 1995 when qualifying for the World Championships marathon team. But as a 9 time winner of the Lincoln Marathon, this lady knows how to run fast when it counts. And win. I’m happy to announce that Roxi has joined Nebraska Run Guru Elite. With a single purpose. Just the way I like it. Joining Roxi on NRGE is longtime coach and friend Ron Olsen, the only person to run every single Lincoln Marathon. Rumors that we are considering sponsorship from Zumba are ridiculous. We are runners that train hard to race hard. Outside of daily drills, we don’t need no stinkin squats. 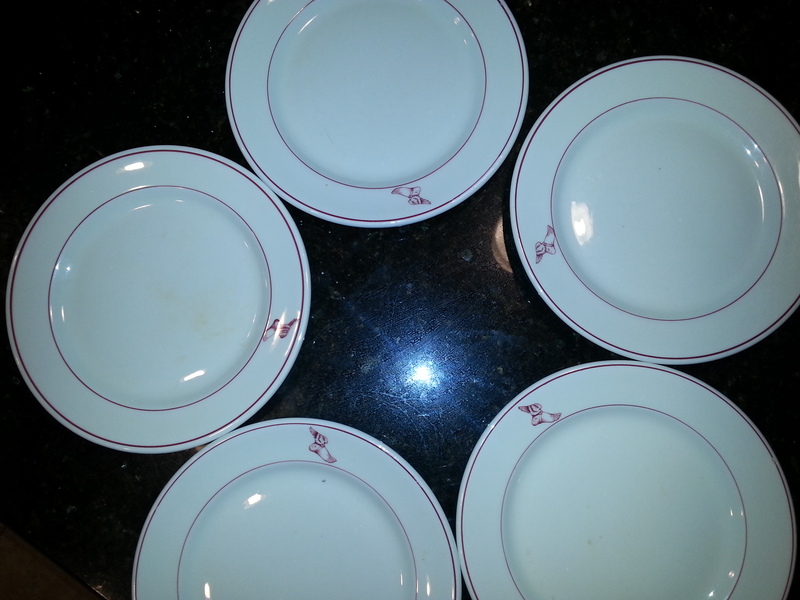 Even our daily china is running themed. 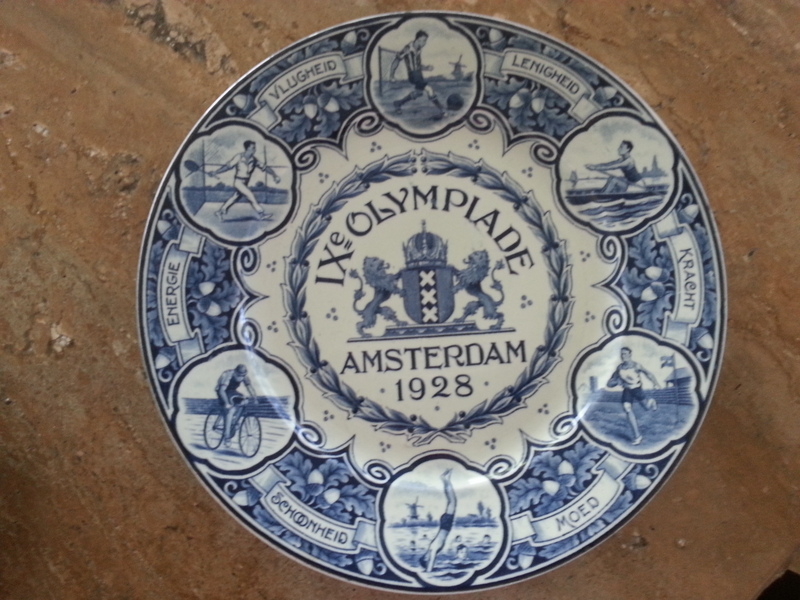 I found this set several years ago and couldn’t resist the winged foot design. 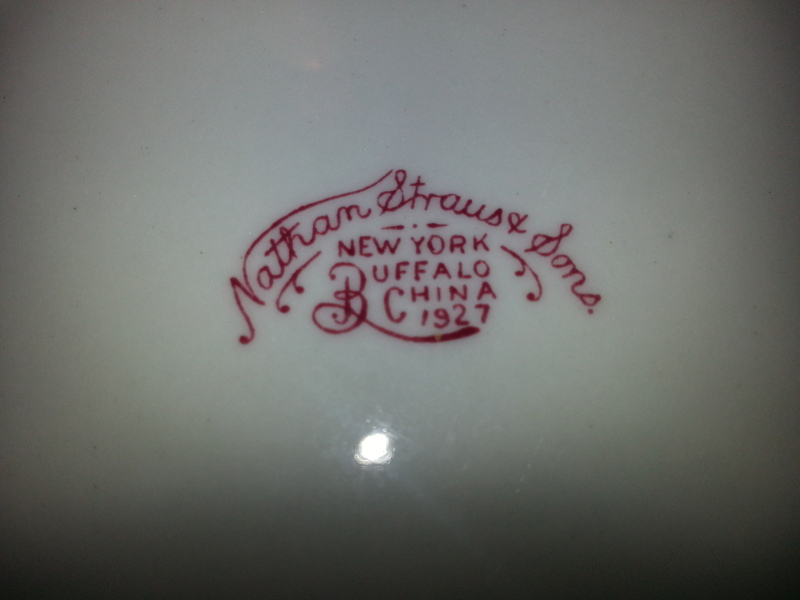 Apparently it was produced for a hotel in Buffalo, NY. It proudly adorns my table these 86 years later. This entry was posted in Uncategorized on August 29, 2013 by runguru. Last night I got to showcase my culinary skills. Harvested the remaining lettuces and spinach for the salad (eaten last in the European fashion). Mizuna, swiss chard and turnip greens sauteed on one side. Sweet Kennebec potatoes and just picked green beans on the other. Fresh varietal tomatoes with feta and basil, and some hand cut pork chops rounded out the meal. I think I impressed our guests, one being the former head of City Sprouts, Omaha’s first not-for-profit community garden. Do you see where I’m headed with this? So we are keeping quite busy building our dream and our fitness together. If you love what you do that is great. If you love who you are doing it with, well that’s just heaven. On Our Little Slice. This 1928 Amsterdam Olympic plate was issued by Delft. A fine example of their exquisite hand painting. 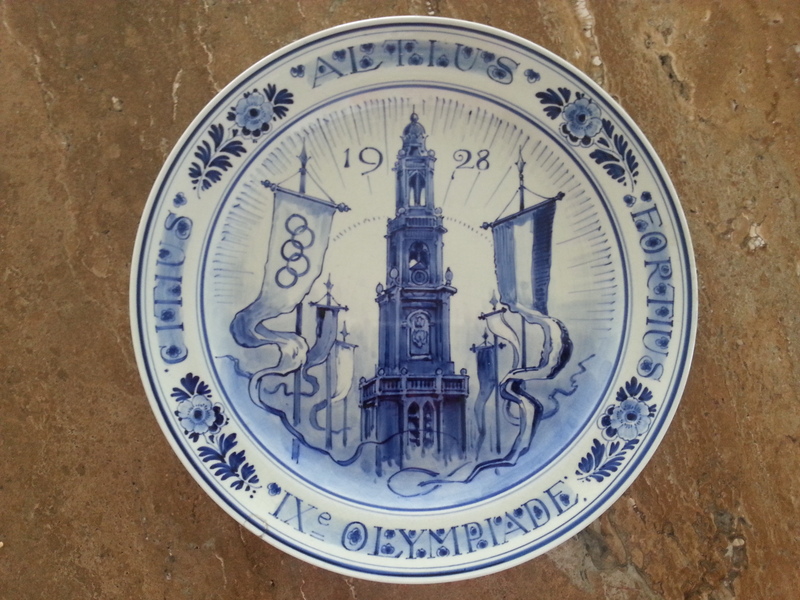 And this plate commemorating the same Olympics was issued by the Societe-Ceramique out of Maastricht, Holland. Even more intricate and collectible than the Delft. This entry was posted in Uncategorized on August 28, 2013 by runguru. I’ve had business in “the city” the last couple of early mornings and used that opportunity to run at my old dojo. Recognizing that the heat keeps away the un-Real Runners, it has still been strangely very quiet. Where the heck is everyone? Nary a varmint to be seen. This morning only a solitary, grumpy toad. 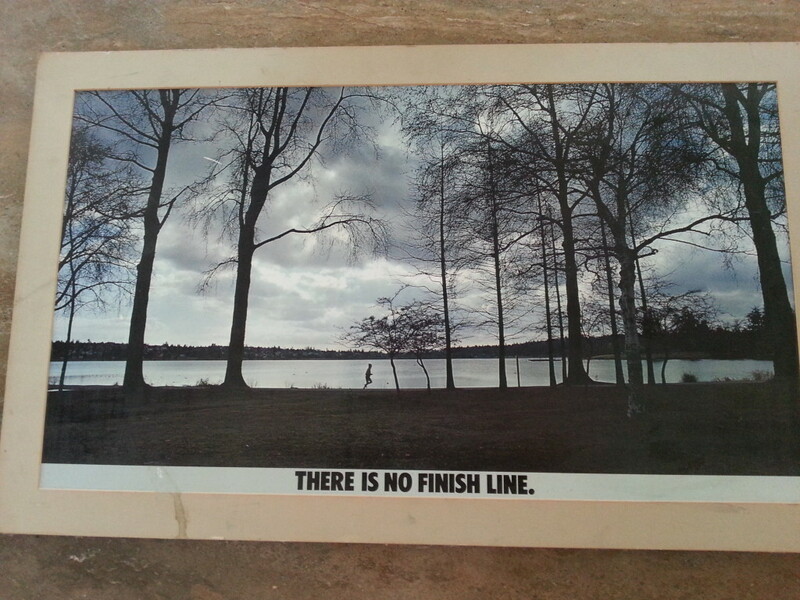 And with the calm all around, Lake Zorinsky has been perfect for reflection. Reminding me that it was this solitude that first drew me to West Omaha and 18312 Ontario St. in particular. The years spent there providing me quick escape through the preserve and to my favored training ground. And my meditation lodge. Stripped down, basking in the sun, mind cleared of all responsibilities. Recharged and ready for whatever needed be done. It really was having the preserve as my back yard that provided me with comfort. If good fences make good neighbors, having a wildlife preserve makes for much better. I’ve put the home up for sale, new paint, new carpet, etc. etc. It is listed with B.J. Brown of NP Dodge, just under $400K. Over 3500 square feet with the best views you will find in West O. If peace and serenity sounds like something you can live with, give her a call. 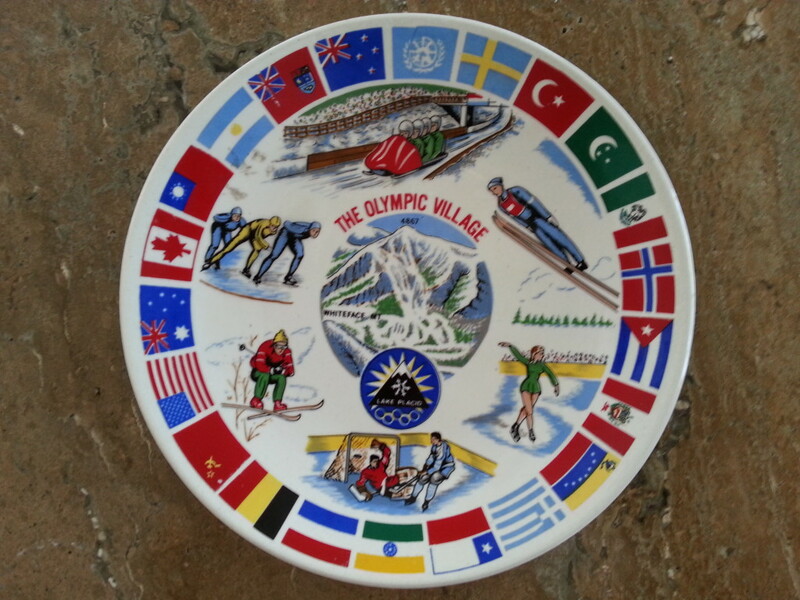 This plate is from the 1980 Winter Olympics In Lake Placid, NY, also host to the 1932 Winter Olympics. Commemorative plates from many Olympics, Commonwealth Games, and other significant events are part of my collection. I’ll be sharing those with you too. This entry was posted in Uncategorized on August 27, 2013 by runguru. This was my favorite saying for the 12 years I rode herd over Team Nebraska. Along with “Giddyup!” and “In It To Win It“. “Once a Mate, Always a Mate.” It was my way of saying that if you were on my club there was nothing I wouldn’t do for you. And that no matter who you were, you should be Proud that you were a part of Something Very Special. An Exclusive group that represented All the Best of Competitive Running in Nebraska. Each person bringing different talents to be sure, but Pride and Honor being the unquestioned binding agent. Determination and Potential being next on the list, in that order. And Racing next, Often and with Gusto. That was My Way and it worked Very Well for over a decade. There are still some that represent Team Nebraska that remember. And others that will never forget. Among those a list of heroes for Nebraska running. James McGown, Suzanne Weeder-Einspahr, Mike Morgan, Angee Henry, Peter van der Westhuizen, David Adams. It is one of those that now comes back. I’ve often told the tale of how I built Team Nebraska on the back of James McGown. His allowing me to coach him an honor I’ll never forget. 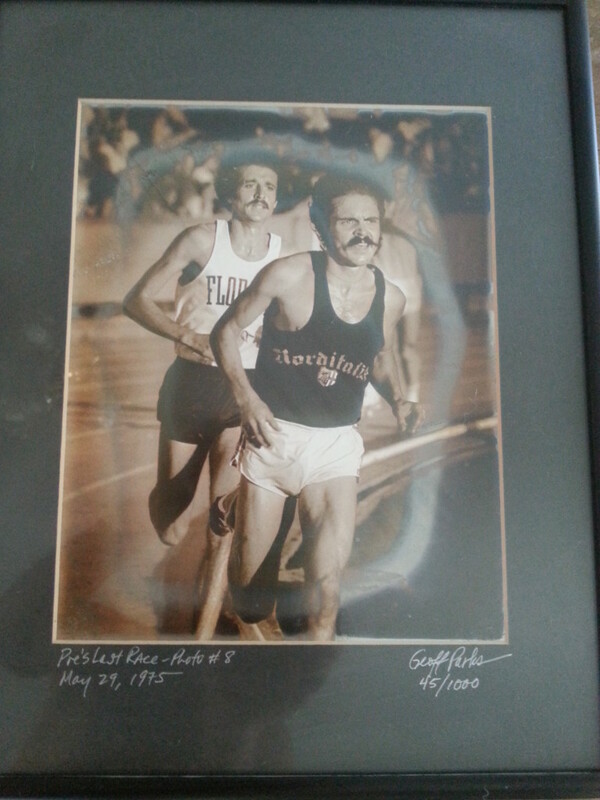 Using the daunting original McLatchie Method which led to two consecutive Olympic Trials Marathons. Runner’s World did a feature article on James leading up to the 2004 Trials, “The Long Shot.” About a hard scrabbled cattle farmer from Western Nebraska, up at dawn to rustle the herd, hard 20 milers, and then off to a regular job. No excuses, and like a Real Cowboy, No Fences. And after retiring from Real Racing winning a USA Trail Marathon National Championship. James remembers all that too. And it is with delight and promise that I welcome him as Nebraska Run Guru Elite’s newest member. He’ll turn 40 in less than a year and will once again carry our dreams on his shoulders. Kudos to John Tully for getting half of Friday’s quiz. The 2:56:41 Houston Marathon time belongs to Maureen Larsen. No one guessed the second signature, Christy Nielsen-Crotts with her 1:18:56 Half. I’m sure they remember. This entry was posted in Uncategorized on August 26, 2013 by runguru. Anthony Yahle of Ohio was without a heartbeat for 45 minutes, legally dead. And yet a miracle occurred and he came back to life. He’s pretty close to sainthood the way I understand the process and at 37 years old has time to pull it off. I’m feeling new life in these old bones. Yesterday’s 6.5 miles included 3.25 faster than my time at the Run For Justin 5K earlier this summer. Maybe not Lazarusesque but a glimmer, a spark, a chance to dream again. And today’s poster offering also from Texas. The 2003 edition of the Houston Marathon is special to me because an old friend, Sean Wade, finally won the full, turning in a 2:24:43 at age 36. It was the first and only year in the history of the race that there were no Invited Elites. Still very cool because Sean had finished runner up on four different occasions, including his 2:10:59 in 1996. That race punched his ticket to the Atlanta Olympic Games where he led the Marathon for the first 7 miles, and me in the stands about to wet myself with excitement. I also had been coaching a young lady from Omaha, she would run her lifetime personal best and finish 3rd overall, her signature appears on the poster. As does another Omahan I was working with at the time, as you can see her 1:18:56 was her best half marathon time in 5 years. And tying in my love for food, also with a life time personal best of 2:56:22, Paul Braunschweiler in the upper left. Good news for Omaha, Paul is back in town and looking for a spot to open a new restaurant. If you’ve an inkling of who the women are, send your answer and see your name on Monday. This entry was posted in Uncategorized on August 23, 2013 by runguru. Perhaps the biggest bonus of the Simple Life are the genuine people on Our Little Slice. No tanning salons, no teeth whitening, no clipping and dipping, no aesthetic enhancements, or embellishments at all outside of a few sun faded tattoos. The only common accoutrements the sheen of sweat on brow and dirt beneath nails. Hard working folk that don’t have time, need, or patience with self absorption. Linda and I are fitting right in. And they are amazed that we work like they do and still have the energy for our daily runs. Yep, we’ve finally put the round peg in the round hole. 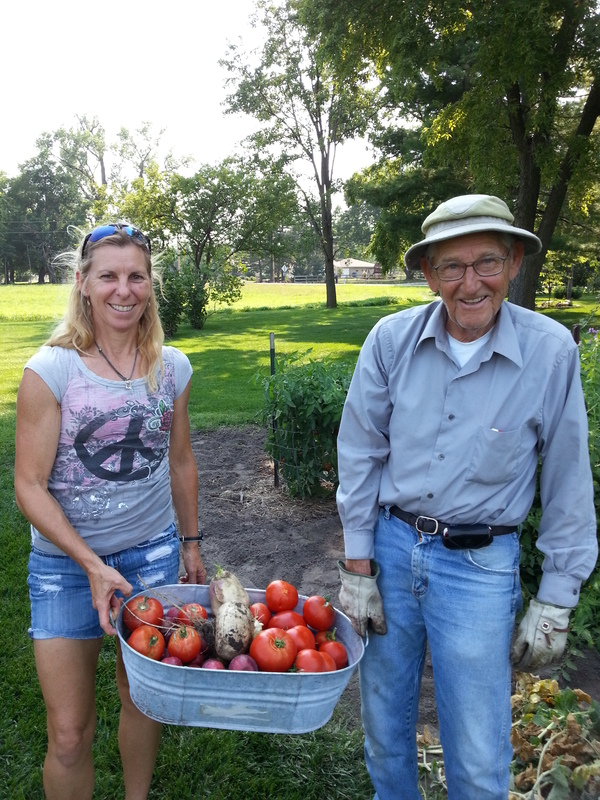 Our neighbor Carl shares his bountiful garden with all. Delicious Winesap Apples, beautiful tomatoes, and gorgeous turnips fill our tub. At 84 he is the elder statesman, local historian, and inspiration for hard work. He tends 10 acres all by himself, never misses a day, and makes us all look like slackers. We should all look so Real at his age. He’s also a dead eye with his rifle, taking out a rogue and manged fox from 50 yards on Monday. Congratulations to the winners of last weekend’s Pike’s Peak Marathon, the USA Trail Marathon National Championships. Alex Nichols (28) of Colorado Springs took the men’s title in 3:43:38 and Stevie Kremer (29) of Crested Butte the women’s in 4:17:13. 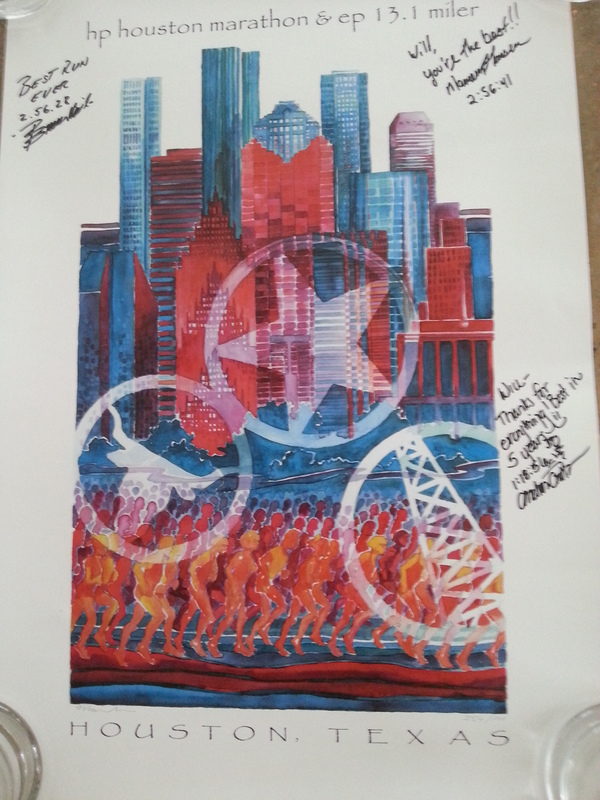 Today’s art offering: The 1985 Houston Marathon winners autographed this poster, I’ll feature many more Houston pieces in the upcoming weeks. Winners were Marty Froelich (2:11:13) and Sylvia Ruegger. Sylvia ran 2:28:36 that day and that mark still stands as the Canadian Women’s marathon record. Pic a little blurry, too much coffee. This entry was posted in Uncategorized on August 22, 2013 by runguru. A huge tip of the sombrero to the mother that turned her daughter over to police following the skinny dipping incident at Carter Lake. During a “bust” the young lady jumped in the lake and swam to, what she thought, safety. A three hour possible drowning search followed, using valuable resources and manpower. When mom found out about it she did the Right Thing. If only more parents were concerned with raising their children properly and less with preserving their “self esteem” and reputation the world would be a much better place. Sometimes the most necessary lessons in life are the hardest on all concerned. Hug your kids today, you bet. But keep their nose pointed in the Right Direction and they will love and respect you later and forever. This entry was posted in Uncategorized on August 21, 2013 by runguru. The dojo is dead, long live the dojo! I poured nearly 13 years worth of sweat, a little blood, a few tears, and gallons of paint at Zorinsky from 2001-2012. And more than 20,000 miles of running. I tended it, promoted it, cared for it, loved it. Held races, time trials, coaching and training sessions. Extolled its excellence. Hiked it at night, biked it when injured. Admired its natural beauty and abundant wildlife. The Real Friends and Real Runners. Ah, the memories I made that I’ll always have and hold. But not all will be fond. There was the constant “stank eye”, the lies and whispers and finger pointers. And the occasional bird being flipped. The rude and crude, the self righteous. The zealot hiding behind trees with camera in hand hoping for some indiscretion-and when not forthcoming fabricating it just the same. The indignant and belligerent. And hundreds of spandex clad Lance Armstrong wannabes. The Nut Jobs. I’ve been contacted by several that would have me come out and mark my measured points once again. But no, I think not. I’m done with my former dojo and have moved on to more serene digs. Wide open spaces, friendly farmer faces, peaceful easy paces. Shady lanes and weather vanes easing all pains. This might be the very first piece of running art of my collection. Given to me by Tommy Anglin in 1979 for helping with some remodel work on his barn. Like me, a little tattered around the edges but in it for the long run. The message as timeless today as it was then. And in hopes of inspiring another athlete, I gifted this piece to the son of my Complaint Department Chair. 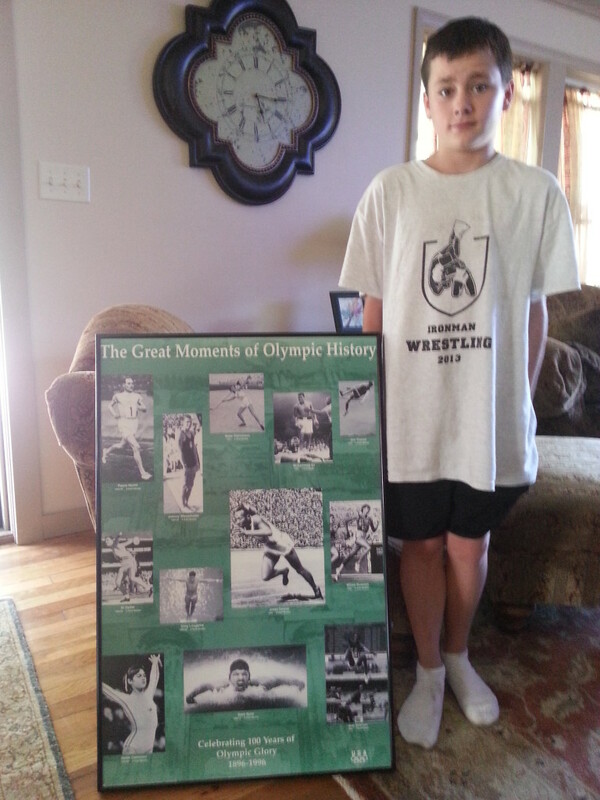 It hung in my son’s room for over a decade, I hope Noah now dreams the dream of greatness. This entry was posted in Uncategorized on August 20, 2013 by runguru. My first week of training in the books, just under 40 miles. My inner Stud yearning for expression, my old body rising to the occasion once again. Most of my runs solo or with Jedediah, my favorite running partner now gainfully employed, of course a story behind that. She too had her first week back to training, I’m keeping her focused on the big picture though. 2014 USA Masters Indoor National Championships. Last time there she brought home a couple of shiny medals in the 45-49 age group. Now 50 she will be a force to be reckoned with. Team Nebraska is lucky to have her. And so am I.
Nebraska Run Guru Elite has added another studette to the roster. If you’ve never heard of Scottie Shaw, you will soon. Way to go Matt Centrowitz. 1500 Silver behind Kiprop. Did you catch the USA lass leading off the women’s 4 X 400 meters? Whatever that was on top of her head looked like Jed’s previous night’s dinner that I scoop out of the yard the next morning. No accounting for taste I guess. How about a little more concentration on the relay and a little less on trying to make a fashion statement. Might turn that silver into gold. Congratulations also to my old buddy Mike Aish. Third Overall at the Leadville 100 this past weekend in an amazing 18:27:57. Mike’s wife Nicole served on the Women’s LDR Executive Committee with me for several years. 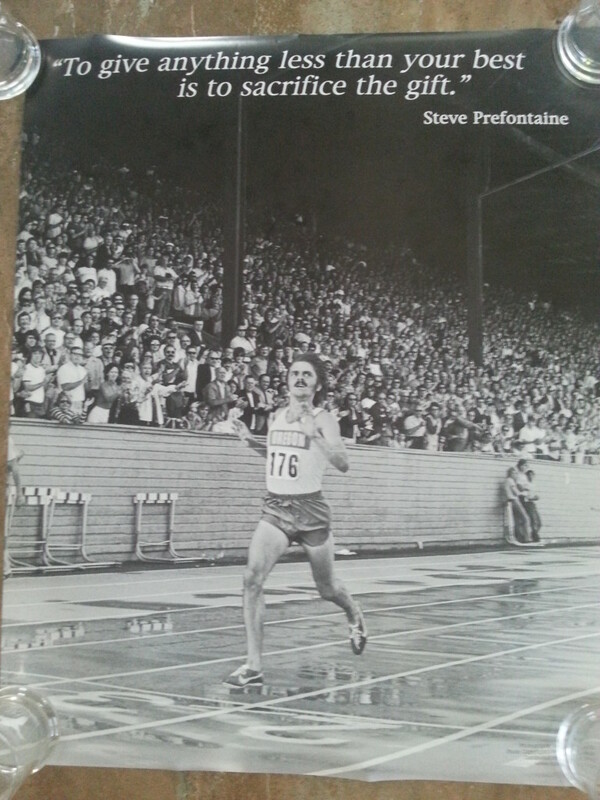 He has one of the largest collections of running books anywhere, rivals my own, a true historian of our sport. A former New Zealand marathoner, and exceptionally nice guy. Omahan Tim McGargill completed the daunting course in 26:46:51, darned impressive for a flatlander. 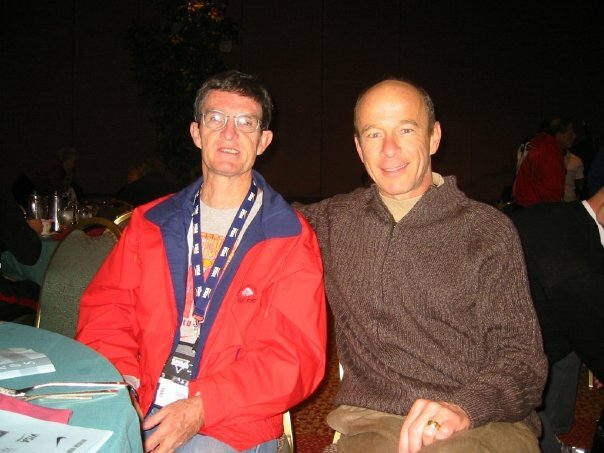 Gerry & I back in 2004 when he was inducted into the USATF Hall of Fame. We’re both a little older, grayer, wiser and happier now. This entry was posted in Uncategorized on August 19, 2013 by runguru.